Product prices and availability are accurate as of 2019-04-08 22:14:32 EDT and are subject to change. Any price and availability information displayed on http://www.amazon.com/ at the time of purchase will apply to the purchase of this product. 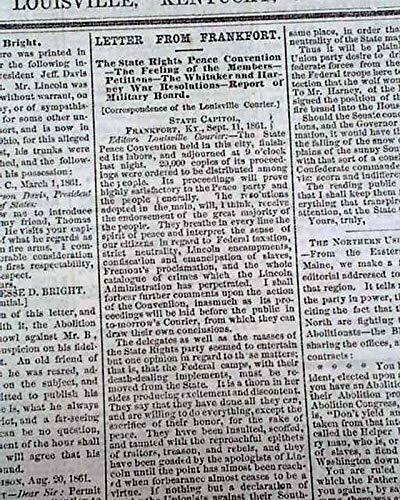 LOUISVILLE DAILY COURIER, Kentucky, Sept. 12, 1861 * Rare pro-Confederate title * 1st year of the Civil War Louisville is difficult to categorize as Union or Confederate during the Civil War as, depending on the time, there were factions within the city supporting both. To placate both sides the two leading newspapers took their stands: the "Courier" was very much pro-Confederate & the "Journal" was more pro-Union. This is the pro-Confederate newspaper. 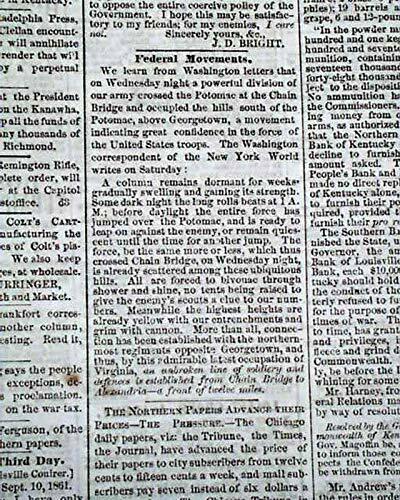 The front page has: "Federal Movements" "The Northern Papers Advance Their Prices--The Pressure" "Letter From Frankfort" "Kentucky Legislature" "The Northern Usurpations Exposed" "The Peace & Neutrality Feeling in Boyle" "The Rebel Troops on Munson's Hill" & more. 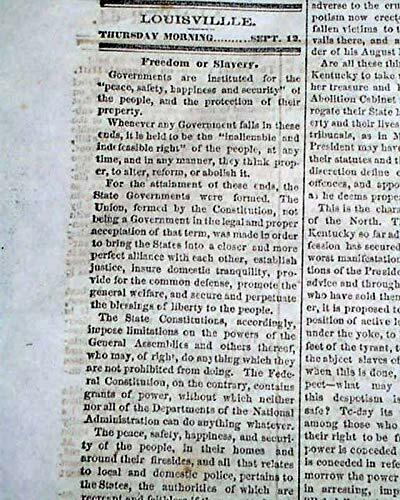 Inside has a lengthy editorial: "Freedom or Slavery" as well as: "The Failure of Neutrality" "Meeting in Russell County" "War News" "Kentucky's Policy" "Against The South!" 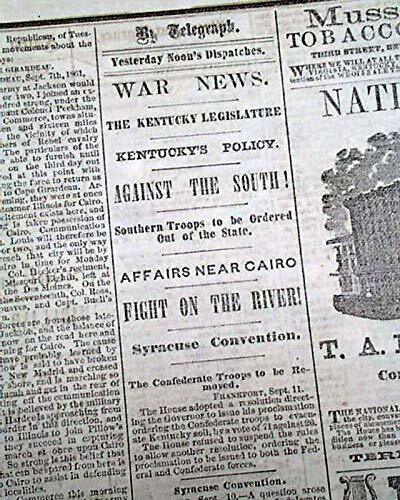 "Southern Troops to be Ordered Out of the State" "Affairs Near Cairo" "Fight On The River!" and more. There is more on the back page with: "Maryland To Secede!" 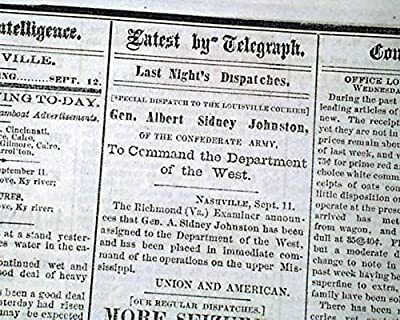 "More Political Prisoners for Ft. Lafayette" "Beauregard's Forces" "170,000 Southerners" "Despotic Russia Endorses Lincoln" and a brief dispatch noting; "Gen. Albert Sidney Johnston of the Confederate Army To Command the Department of the West." Four pages, archivally rejoined at the spine, close-trimmed at the spine causing some loss to spine margin of all 4 pages but mostly affecting ads and no effect to any mentioned articles. Minor mouse-chewing to the lower right corner is not close to any text. 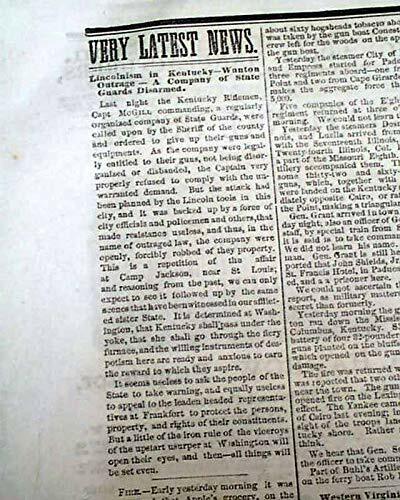 Rare Newspaper An original, printed in 1861 We make every effort to describe each item accurately and to provide photos which reflect both content and condition. Please see the item's description and photos for details, and feel free to be in touch if you have additional questions.